In 2016, CareSpeak partnered with Molina Healthcare to pilot a new intervention utilizing our text messaging reminder programs in conjunction with Medication Therapy Management (MTM). The pilot was designed to increase medication adherence, and reduce healthcare utilization for a disabled Medicaid population with high disease burden. At this year's Academy of Managed Care Pharmacy annual meeting, Jennifer Strohecker, Senior Director of Pharmacy at Molina Healthcare presented the impressive results of the program - A $140 per patient per month reduction in healthcare utilization after four months on the intervention. The pilot adds further validation to our prior clinical studies showing that the use of these interventions leads to increased adherence and better patient outcomes. An abstract of the poster presentation, which earned a gold medal at the annual meeting was also published in the Journal of Managed Care and Specialty Pharmacy (See page S113). The poster presentation is displayed below. Chronic disease burden is increasing and medication therapy is a cornerstone of disease treatment. Rates of medication non-adherence are high, with close to half (50%) of patients not using their medicines are prescribed, which contributes to morbidity, mortality and billions in avoidable medical expense annually.1 Methods to improve medication adherence must be personalized and aimed at resolving barriers.2 mHealth technology may provide a low cost, personalized channel to promote pill-taking behavior in low-income patients with multi-morbidity, when combined with a pharmacist consultation. To describe a novel effort to improve medication adherence and reduce utilization through coordinated, high-touch interventions with an in-house, pharmacist MTM model and mobile phone text message reminders in a disabled Medicaid population with high disease and medication burden. 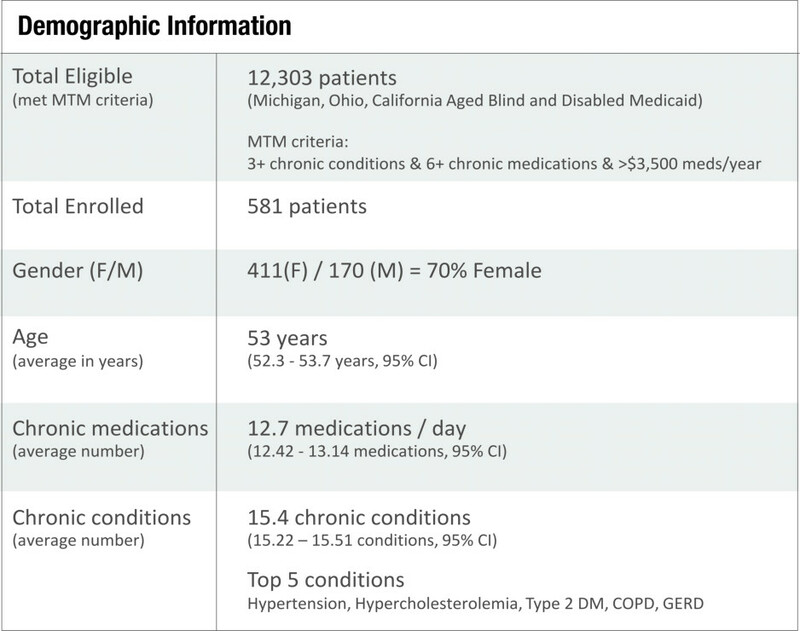 Patients were identified from an ABD (aged, blind and disabled) Medicaid population across 3 states, who met MTM eligibility criteria (3+ chronic conditions and 6+ chronic medicines). Recruitment occurred over a 3 month period, or until 500 patients were enrolled. After consent and enrollment, all patients received an interactive, telephonic MTM consult with an in-house pharmacist. The pharmacist coordinated appropriate care and enrolled the patient in a 2-way text messaging program. Text messages were personalized and delivered at requested times of the day to assist patients in medication administration. Upon receipt of the message, patients acknowledged medication administration with a response text. In addition, the patient could also interact with the health plan pharmacist. 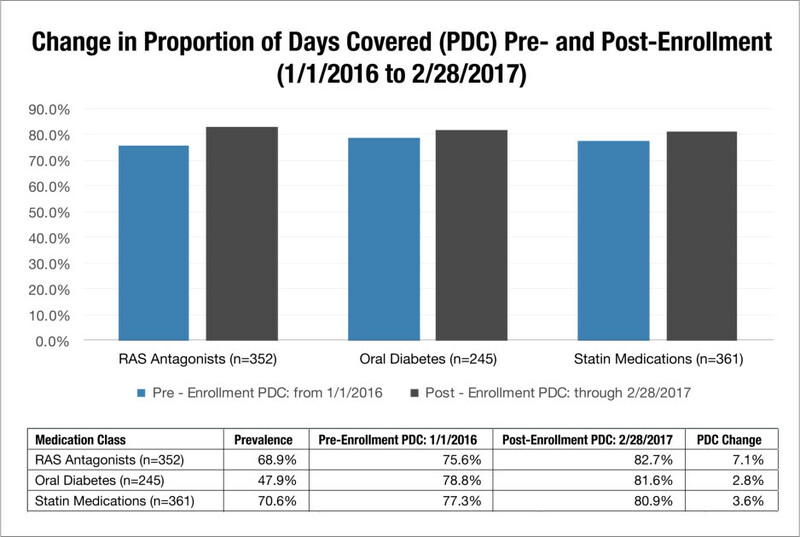 Patients were evaluated for chronic medication adherence with baseline proportion of days covered (PDC) calculated beginning 1/1/2016, then followed forward after program enrollment. Change in healthcare utilization per member per month (PMPM) was assessed using medical claims data to evaluate the change from baseline (8 months prior to enrollment). Patients who enrolled after September 30, 2016 were excluded, as well as persons who disenrolled from the health plan. Reasons for program refusal were also captured. Out of 12,303 eligible patients, 581 were enrolled and 1,559 declined participation over 4 months. A belief in lack of benefit (38%), access to a compatible phone (18%) and failure to know how to text (14%) were top reasons for declining participation. Among enrollees, the average age was 54.4 years; 70% were female; disease and medication burden was heavy (average 7.6 conditions/ 13.6 medications monthly). 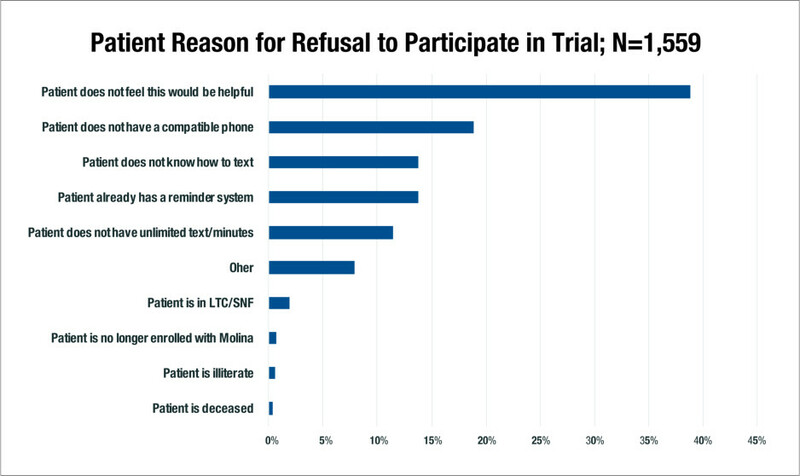 Patient engagement with text message reminders was high, with over 70% of patients (n=354) responding to more than half of delivered texts. In addition, patient/pharmacist interaction via text was ongoing and enhanced collaboration. Results for the first 205 patients enrolled was assessed 60 days after enrollment and compared with a 4.5 month average baseline value. The PDC for statin (n=361), antihypertensive (n=352), and oral diabetes (n=245) medications improved by 3.6%, 7.1%, and 2.8% respectively from baseline. After excluding members with the top 10% of total medical claims (n=39), there was an average reduction of $140.18 PMPM in medical costs for 4 months following program enrollment. 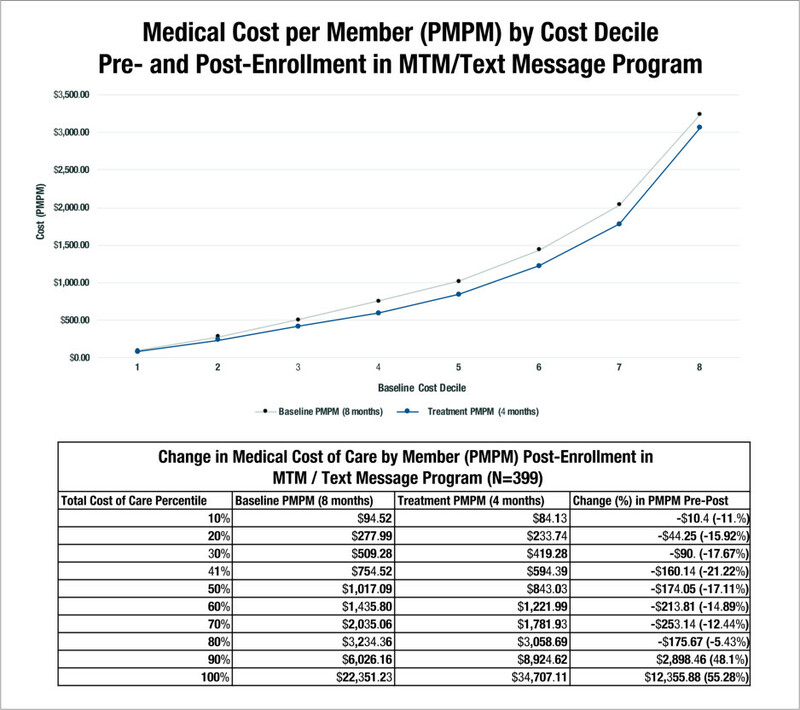 Preliminary results indicate a high-touch MTM intervention combined with interactive mobile phone text messaging is effective in improving medication adherence and reducing healthcare utilization for a disabled Medicaid population with high disease burden. Avoidable Costs in U.S. Healthcare: The $200 Billion Opportunity from Using Medicines More Responsibly. Report by the IMS Institute for Healthcare Informatics. Accessed May 1, 2016. Brown M, et al. Medication Adherence: WHO Cares? Mayo Clinic Proceedings (2011) 304-314.